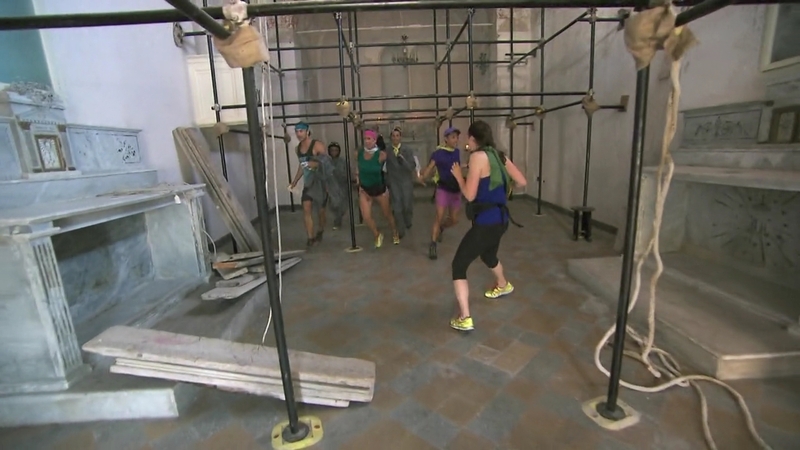 Recap: The Amazing Race 25, Episode 7 – "I've never been so sweaty in my whole life." The 7th Leg begins with Misti & Jim opening the first clue telling teams to fly to Palermo, Sicily. Misti can’t want to get out of Marrakech. But they’ll have to stay a little longer as the first flight arrives in Palermo at 8pm tomorrow. They are not looking forward to spending the day at the airport. Adam & Bethany like this newlywed bootcamp that is the Race. Tim & Te Jay are excited about going to Sicily. They say they’ve been bickering about stupid stuff on the Race, which is less than back home. As long as Te Jay accepts when Tim is right. Kym & Alli are able to get on the same flight as Misti & Jim. Adam & Bethany, Tim & Te Jay, Brooke & Robbie and Amy & Maya get on the 2nd flight arriving at 8:40pm. Kym & Alli want to beat Misti & Jim because they are their biggest competitors, they got a Save and a non-elimination AND Jim’s “nasty.” At the airport, they write “Team No-Fun” on Misti & Jim’s dirty car. 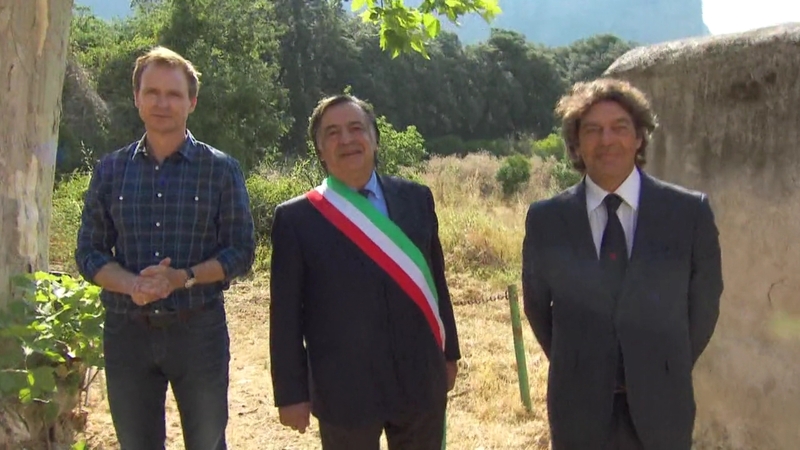 But once they arrive in Palermo, they decide to stick together and share a big taxi until they get to the Route Marker. Misti & Jim talk about how Kym & Alli were standoffish at first and while they feel a little warmer toward the Cyclists now, they don’t “love” them as much as the other teams. The 2nd flight arrives and the locals give the teams an excited welcome as they all try to usher them into their taxis. The six teams rest for the night. 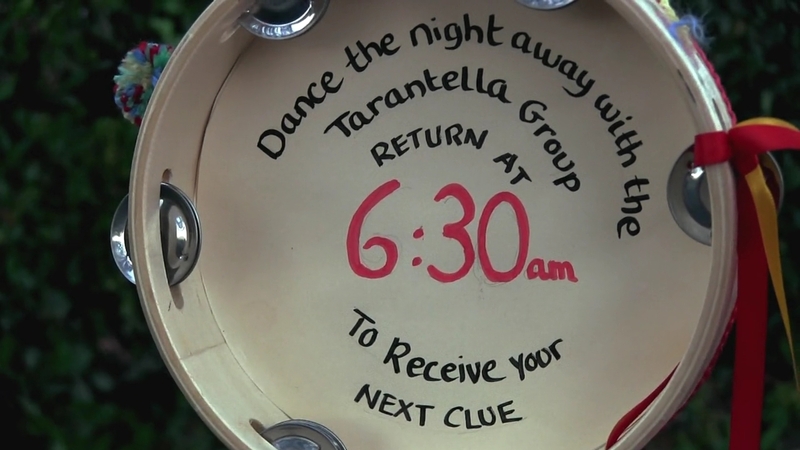 At 6:30am, Misti & Jim and Kym & Alli open the next clue pointing them to Villa Constanza. Amy & Maya and Brooke & Robbie leave at 6:40am and Tim & Te Jay and Adam & Bethany leave at 6:50am. Misti & Jim and Kym & Alli ask to use a local’s cell phone to call for two taxis. The other teams, meanwhile, are struggling to even see one. The frenemies arrive at the cluebox where they find the Road Block. 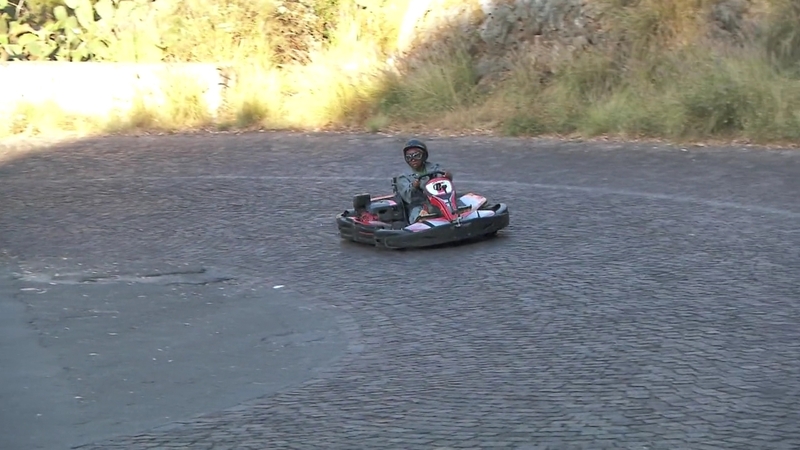 For this Road Block, teams will retrace the route of the famous Targa Florio auto race in a go-kart. 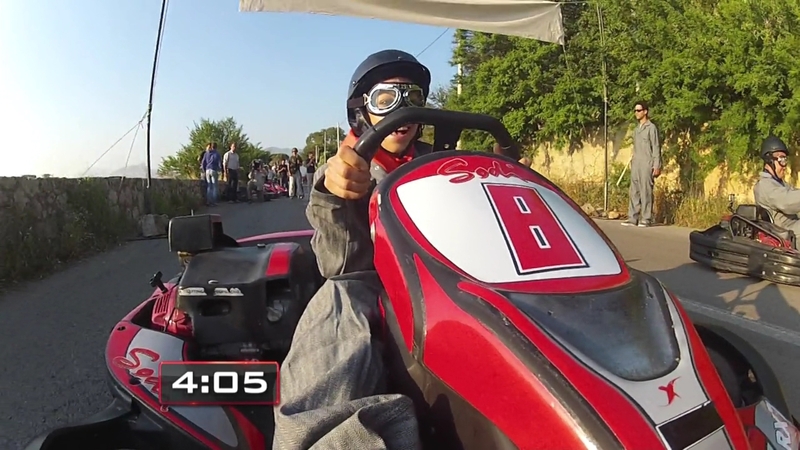 If they can finish the course within 4 minutes and 7 seconds, they will receive their next clue from racing legend Nino Vaccarella. As Kym and Jim head up to start the Road Block, Alli and Misti must ride back in their taxis to Antico Stabilimento to wait for their partners. Amy & Maya, Adam & Bethany and Tim & Te Jay finally find taxis while Brooke & Robbie wait 40 minutes to find one. The green flag waves and Kym and Jim start down the cobblestone course. Jim tries to stay in front of Kym, but she ends up passing him several times anyway. They both complete the course within the time with just a few seconds to spare. They can now hop into classic cars to be driven by professional racers to their partners. Maya heads down the course alone, but she fails to reach the finish line before the 4 minutes and 7 seconds. She has to follow the pace car back up. Meanwhile, Kym & Alli and Misti & Jim reunite and they open the next clue revealing the Detour. In Painters, teams must climb scaffolding at the Tonnara Florio to help restore a fresco while lying on their backs. 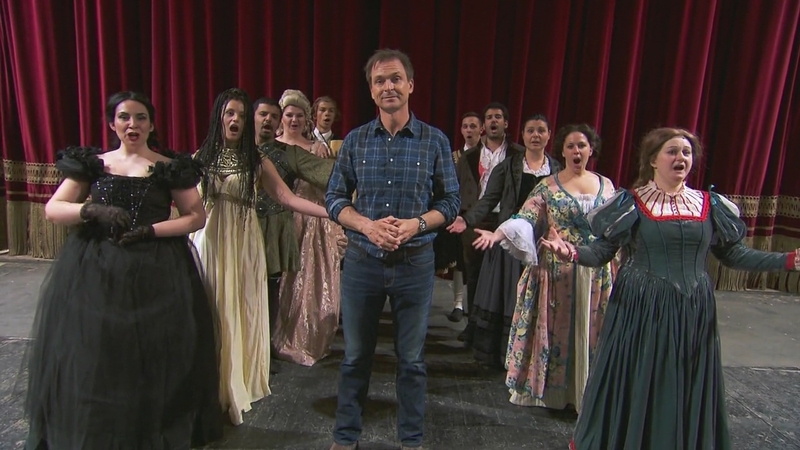 In Posers, teams will head to Teatro Politeama Garibaldi where they will listen to 10 opera singers and then correctly identify the costumes backstage by matching them to their character and opera in the order they were on stage. 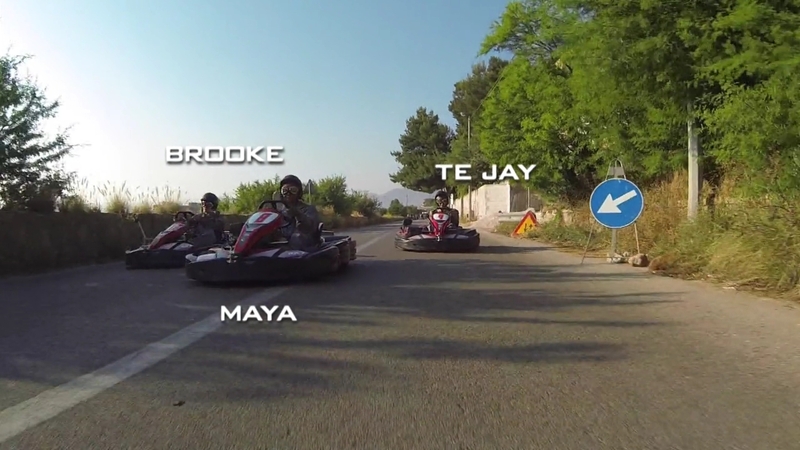 Back at the Road Block, Maya catches up to the other teams and they all four head down together. 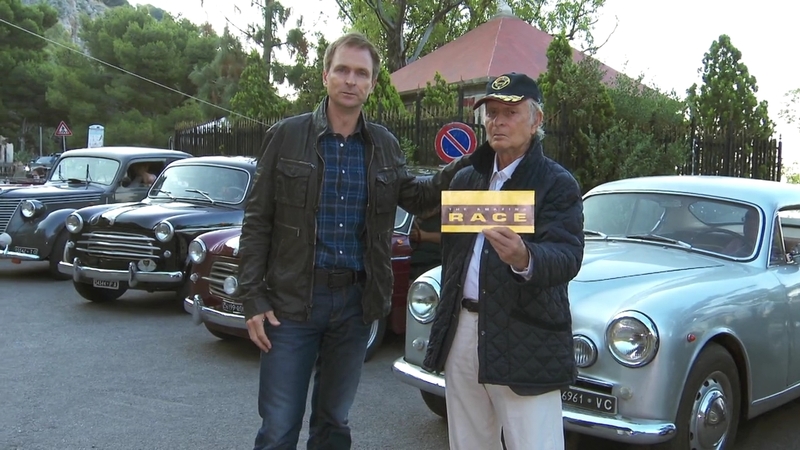 They all manage to finish the course in time and they hop into their vintage cars. Amy & Maya and Adam & Bethany are reunited first and both choose Painters. Tim & Te Jay and Brooke & Robbie are in last and read that only four teams can attempt the painting Detour at a time. Tim & Te Jay give the painting a try, hoping to beat one of the teams there. Tim & Te Jay catch up to the other two teams and it is a mad dash to the room with the scaffolding. Adam & Bethany and Tim & Te Jay climb up first, which means Amy & Maya must now go to the other Detour. Brooke & Robbie decide to immediately go the opera. The singers begin performing and Brooke & Robbie have no idea what they just sang. They go backstage and realize they just need to remember the costumes. The different displays actually list the character and opera, so they need to just write them down on a provided program. They decide to go back and watch one more time. Over at the painting, the artist gives Misti & Jim and Kym & Alli the thumbs down. But eventually, Misti & Jim get approved first and open the clue pointing them to the Villa Niscemi, the Pit Stop for this Leg of the Race. Kym & Alli are close behind. Amy & Maya join Brooke & Robbie for the next performance. Brooke & Robbie hand their program over for a check, but one of their costumes is missing an opera. Amy & Maya also get one wrong, so both teams decide to work together. Phil welcomes Misti & Jim and says they’re celebrating this 300th Leg of The Amazing Race with them as Team #1. Kym & Alli come running in and they are Team #2. Adam & Bethany and Tim & Te Jay get the thumbs down for their first check. Amy & Maya and Brooke & Robbie, meanwhile, get approved. But Brooke & Robbie are annoyed at letting Amy & Maya go first since they were here first. They finish in 3rd and 4th, respectively. Adam & Bethany and Tim & Te Jay finally finish. It’s now a race to avoid being last. Adam & Bethany check-in as Team #5. That means Tim & Te Jay are last. But this is a Non-Elimination Leg. Yay for a Non-Elimination Leg! The Amazing Race Philippines‘ lack of Non-Elimination Legs has made me appreciate them a lot more. Hehe. Palermo looked beautiful this Leg. And the drone!!!! shots were just stunning. The Leg was good overall. I think the tasks really leant themselves to this being a perfect Leg for a Non-Elimination. The dancing and overnight rest reminded me very much of old TAR when teams would mingle with each other during Hours of Operation. Most recently, it reminded me TAR Australia vs New Zealand teams singing in the early morning hours as a task waiting for the morning opening time. The Road Block must have been incredibly fun. What an experience that must have been. A thrilling ride down a famous course in a beautiful city. The Detour was solid too. The fresco painting was definitely challenging and on paper it definitely seemed like the easier task. But the opera side of the Detour was definitely the smarter choice. Memorizing 5 costumes (5 for each team member) would probably be must easier and take less time than the painting which was both hard and tedious. Still, they were both good tasks and this was a Non-Elimination anyway. Yay for updated midseason opening credits! The teams are really delivering this season. They are all nice together, yet they are all still very competitive. No need to be best buddies or form alliances. Just work together when you need to, but Race your own Race, regardelss. Also, this episode made me think about TAR’s rule of trying to avoid showing cameramen and sound guys in shots on the Race. Sometimes they try too hard and they end up discarding great scenes that may include a fleeting shot of a cameraman or something even though using said scene would make things even more interesting and help build excitement. I’ve noticed it many times before, but in this episode, it was during the mad dash at the Detour. They had a quick cut of teams already up on the scaffolding instead of showing more of the craziness of them walking into the room. Other times, we may lose perspective when the shots are always close-ups instead of wide shots that may include a sound guy. They didn’t edit out the cameraman when Amy & Maya passed Brooke & Robbie in their taxis from the airport. And it was awesome. I really helped build that excitement. So I think TAR doesn’t need to be overly conscious anymore, especially after 25 seasons. Anyway, this was a good Leg. Maybe would’ve wanted something special for the 300th Leg (though I’m not sure how they’re counting), but it was still good. Here’s to 300+ more Legs to come. So happy Tim & Te Jay were saved by a Non-Elimination. I definitely want to see them Race all the way. They’re just fun and so likeable. Too bad their hustle didn’t work this Leg to get themselves out of the bottom like they usually do. But I’m rooting for them to just kill the Speed Bump and survive past next Leg. Amy & Maya are still trudging along. They’ve been great and likeable as well. And they have also been able to do just enough to get themselves out of danger. Definitely rooting for them too. Kym & Alli are still a strong team and it is great to see them be so competitive, especially against Misti & Jim. Adam & Bethany haven’t dominated like I expected them to. And that’s actually a good thing. I definitely want to see them step it up a little. Though I guess we haven’t really seen them struggle too much yet. Brooke & Robbie are still fun, but this episode more than the others, they really played to the camera a little too much. Misti & Jim winning another Leg and almost unopposed was definitely boring. Jim’s attitude about wanting to win to have something to brag about looks to be setting him and Misti up for a big fall. I would not mind. 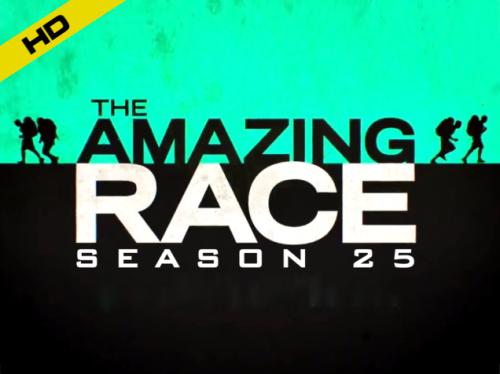 ← Recap: The Amazing Race Philippines 2, Episode 29 (Leg 5, Leg 5) – "Arte-arte naman yung babaeng yan. Nakakairita." With these first seven legs of TAR 25, where do you rank it in your overall season rankings? Hmm… not sure about overall rankings, but I think this is definitely my favorite season since TAR17. For now, I might put it on part with TAR17 and TAR19. Wow! we’re the same. Many says TAR 17 and TAR 19 are lackluster seasons. But I actually loved and enjoyed both seasons. Plus, Ernie & Cindy and Nat & Kat are two of my favorite winners. They also need to realize that if you’re thinking lackluster seasons well it has to be the boring Family Edition and recently, the horrible TAR 24.